1. During an ongoing chat, view contact and deal information from HubSpot CRM. 2. Create contacts in HubSpot CRM during an ongoing chat. 3. Create contacts in HubSpot CRM after chat ends. 4. Create contacts in HubSpot CRM from offline messages. 5. Capture UTM parameters from the URL and update it to the contact's details after chat ends. HubSpot CRM integration is available from Mighty plan and above. Step 2: Go to Apps → CRM → HubSpot CRM. Step 4: Click Connect button → If you are logged in to your HubSpot CRM account the connection will established successfully. If not, the system will prompt you to login HubSpot CRM account. On successfully establishing the connection with HubSpot CRM, you will see the below message. Step 5: Update your preferred settings under "During Chat" and "On Chat Completion". 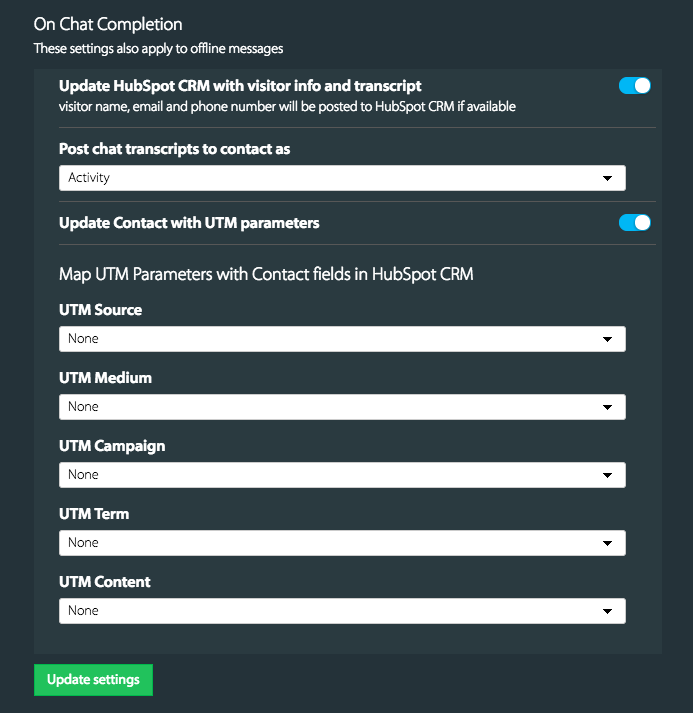 Type the command !createContact (HubSpot CRM) and hit enter. 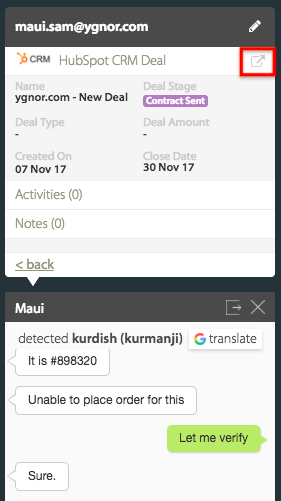 When you click on deal or contact, you can view more details. 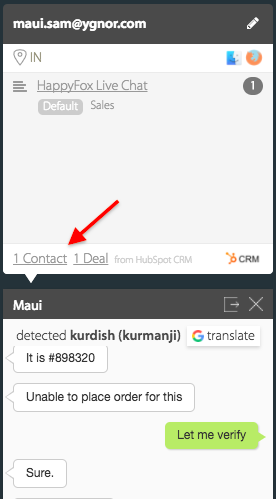 On clicking the new tab icon, located on the top right corner you will to the corresponding contact's details page on HubSpot CRM. Similarly, when you click the Activity/Notes, it will take you to the corresponding contact's details page. 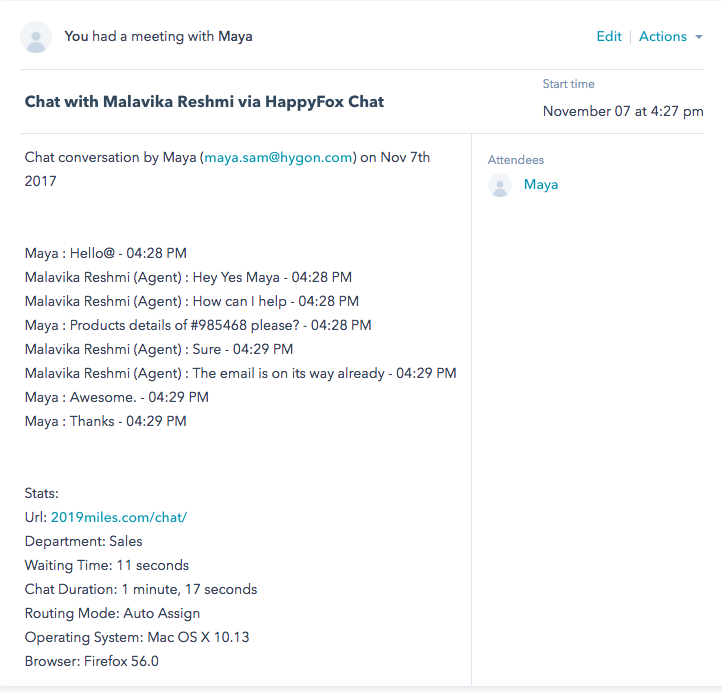 The chat transcript will be added as notes or activity to the contact.